Come along to a Sunday activity day! Have you seen our beautiful new mosaic? The Triangle Garden is a community garden within a local park where people of all ages and abilities can come together and take part in creative land-based activities, such as growing food and flowers, tending plants, creating wildlife habitats and making permanent garden features. We run community gardening activities open to all, once a month on weekends, and community events, workshops, walks and talks throughout the year. Our weekly Gardening Club actively gardens the Triangle Garden and we welcome new volunteers. We welcome help from volunteers at any of our activities. Please contact us if you're interested. 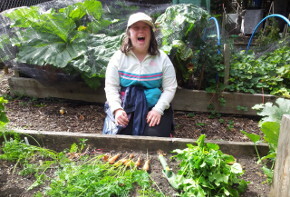 Growing Ability is our social therapeutic horticulture project for adults with learning disabilities, focusing on the abilities and development needs of each individual. 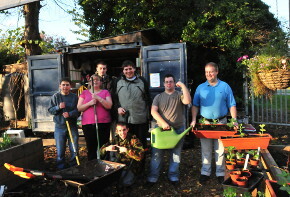 The Growing Gang is a community-based work-experience scheme focused on gardening and work-life skills for adults with learning support needs. It provides gardening services to community spaces and individuals in need. 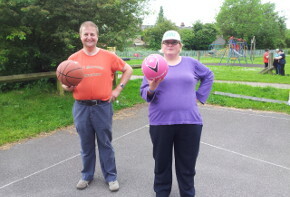 Growing Health is a new project, launched in 2013, which helps adults with learning disabilities to support each other towards leading more active healthy lifestyles. Our trustees are currently reviewing the vision, mission and values of the Triangle Garden before writing a new business plan for 2019-2025.